The current project we are working on is focused on enhancing the standard motion graph algorithms. We are interested in utilizing transition frames presented in video data to inform the transition generation process in order to achieve more realistic transitions between actions. 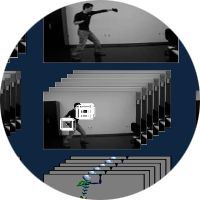 Video data is readily available, less intrusive and easy to produce compared to motion capture. Our algorithm is to reduce human interference during motion creation and improve the realism of the animation.